This is just a sample of some of the items we carry. We are not not primarily a mail order business and while we are happy to ship items to you, please understand that it may take us a few days to get back to you as we stay busy teaching classes (and getting in our own personal practice). 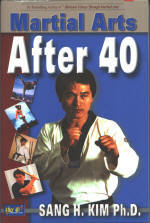 This book by Sang H Kim has excellent advice for martial artists of every age but is especially good for those of us approaching our prime. When you're young and foolish, your body will handle more abuse, you heal more quickly, and you often don't think of the long term effect of your actions. As you get a little older, you're ready to put more thought into what you do and you want to make sure you are helping improve your quality of life. If you're looking at just starting the martial arts or interested in keeping up your practice, this book will help you learn which exercises are beneficial and which are potentially dangerous. You'll learn which types of injuries are most common as you age and how to avoid them. With chapters on diet and nutrition, fitness, agility, flexibility, power, speed, coordination, reflexes, endurance, forms, weapons and more you'll learn how to keep up with those half your age! You're not too old to start getting into the best shape of your life. This book by Davidine Siaw-Voon Sim & David Gaffney is one of the most comprehensive books on Chen Style that I have seen. The authors trained and consulted with Chen Xiaowang, Chen Zhenglei, Zhu Taincai, and other leading figures in Chen TaijiQuan. It takes you through the historical development and philosophical roots of the system, training methods in Silk-Reeling Exercise, forms, Yi Lu, Paocui, Fajing, Qinna, equipment, push hands and weapons. The practical information is followed by a fun final chapter on Chen Family Legends. An excellent book for the serious Chen stylist! Paperback, 224 pages. This is the first of a series of English language books by Chen ZhengLei. 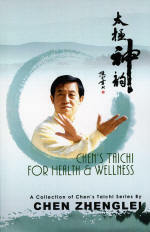 In this volume, Grandmaster Chen presents a complete system to promote health and wellness. 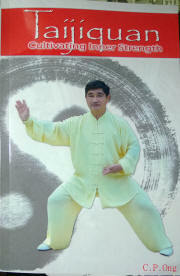 Divided into four sections: Introduction, Basic Drills, Nurtuting the TaiChi Vital Qi, and Chen's Taichi Essential 18 Forms. The first section discusses characteristics of the system, describes some of the health benefits and covers key points and specific requirements. The second section covers warming up the joints, spiral rotations or silk reeling exercises, and footwork. The third section covers a variety of sitting and standing exercises and meditative practices. The fourth section covers the 18 Forms in depth with over 88 photos, detailes descriptions and key requirements. It's difficult to learn only from a book, but if you have an instructor to work with or are already familiar with the form, this book will greatly enhance your understanding of the 18 Form. This is the second of a series of English language books by Chen ZhengLei. 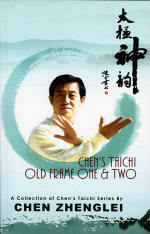 In this volume, Grandmaster Chen presents a detailed description of Old Frame One (LaoJia YiLu) and Old Frame Two (LaoJia Erlu or PaoChui or Cannon Fist). The first section of the book is a general introduction that covers history, benefits, basic requirements, training methods and principles, and basic movements and exercises. The second section covers Old Frame One, move by move. The movements are described thoroughly, requirements are listed, internal strength is described and applications are provided. The same thorough approach is used in section three to cover Old Frame Two. There are well over 500 photos and diagrams in this book! There is a lot of information packed into this book! It covers some history, basic requirements, training methods, basic movements and exercises. It then covers LaoJia YiLu, the straightsword and the broadsword . The movements are presented individually, described thoroughly, actions are listed, internal energy is described and applications are provided. The same thorough approach is used for each form. Each movement is also carefully documented with photographs. This is the book I find myself referring to most often when I have a question about a movement. I've known CP for over a decade and have had the opportunity to train with many of the Chen Grandmasters he has brought to the US. The Jing Ying Institute especially has greatly benefited from the work he has done to arrange workshops in our area. He has been a pioneer in the USA for Chen style taiji and has had the opportunity to spend countless hours training with top grandmasters. The time spent training and traveling to workshops with these grandmasters where he often served as their translator allowed him to develop personal relationships that gave him unique access to their knowledge. His years spent translating for the grandmasters has made him very good at making the language and concepts of taiji accessible to Westerners. This comes across in his book which is easy to read and clearly presents even the most complex concepts. Often analogies to sports more familiar to Westerners are used to explain concepts and photos are used generously. Any student of taiji would benefit from reading this book, but this is a "must-have" book for students of Chen family taiji! Paperback, 366 pages. Grandmaster Willy Lin provides instruction in Chin-Na (Qin Na) the "seize and control" art of Kung Fu. Joint locks, pressure points and cavity presses are used to control, immobilize or subdue attackers. The techniques rely on leverage rather than strength, making them very effective against larger and stronger opponents. Includes an introduction, preparation, basics, counters and a photo gallery. The focus of Volume II is on more advanced defense techniques against arm locks, knives, pushes and bear hugs. Also known as ChuJi Quan, this is the first form in our system. Master Willy Lin, who first brought these forms to the US, demonstrates the form step-by-step. He also includes variations of the form along with the 2 person fighting set which pits the first half of the form against the second half. This form is filled with good offensive and defensive techniques and the two person set builds important skills in timing and distance control needed for fighting. 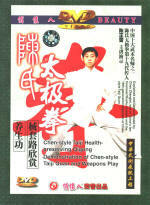 Chen-style Taiji Health-preserving Qigong and Demonstrations of Chen-style Taiji Quan and Weapons Play. This DVD features Chen ZhengLei and Wang HaiJun demonstrating the basic principals of push-hand exercises used to develop sensitivity and responsiveness while working with a partner. Covers basic requirements and methods with practice for a single person. This includes separate practice for foot work and hand movements as well as combining the two. Partner work includes fixed-stance single hand and double hand work and moves on to moving-stance work. 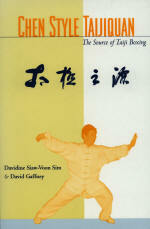 Includes five methods of push-hands and also a demonstration of the Lao Jia Yi Lu form. Even without a practice partner, there's a lot you can get from this DVD. Chen-style Taiji Single Sword (Straight Sword). 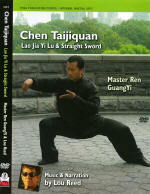 This DVD features Chen ZhengLei and provides details of working with the straight sword. Six chapters cover basic requirements, parts and names of the sword, how to hold the sword and basic movements, detailed step-by-step instruction of the form, demonstrations of the forms, and demonstrations of the Old Frame form. 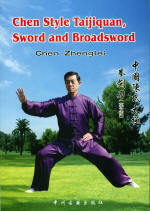 This DVD features Master Ren GuangYi in powerful demonstrations of YiLu and straight sword. Captured in high-def video and surround sound with a soundtrack by Lou Reed, this DVD presents a unique learning experience. Use the "Angle" button on your DVD to view the performance from the side, front or rear. Use "Rear View" to follow along as if you were behind Master Ren as he leads a class. You can also view the forms in "FlipperVision" - a slideshow presentation of nearly 2,000 photos that allow you to see each movement in extreme detail. Choose from multiple languages, two soundtracks for energy or centering and narration by Lou Reed.